Phacoemulsification (FAY-co-ee-mul-sih-fih-CAY-shun). 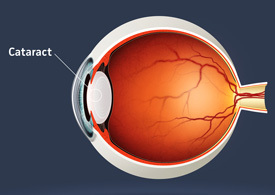 This method, often called "phaco," is the most common cataract surgery in the United States. An eye surgeon uses a special instrument to break up the cataract with ultrasound waves and then vacuums out the emulsified pieces. Phacoemulsification requires only a small eye incision — about 1/8 inch (3 millimeters).